Grandly styled for the traditional home is the Royal Highlands Collection. Prominent decorative scrolling adorns the headboard while heavier carved scrolling accents the pilasters and feet of each piece in the collection. The substantial wood framing of the bed creates a distinct serpentine profile that carries into the design of the case pieces. Brown bi-cast vinyl provides complementing contrast to the rich cherry finish. Traditional cherry and birch veneers accenting furthers the elegant presentation of the Royal Highlands Collection. 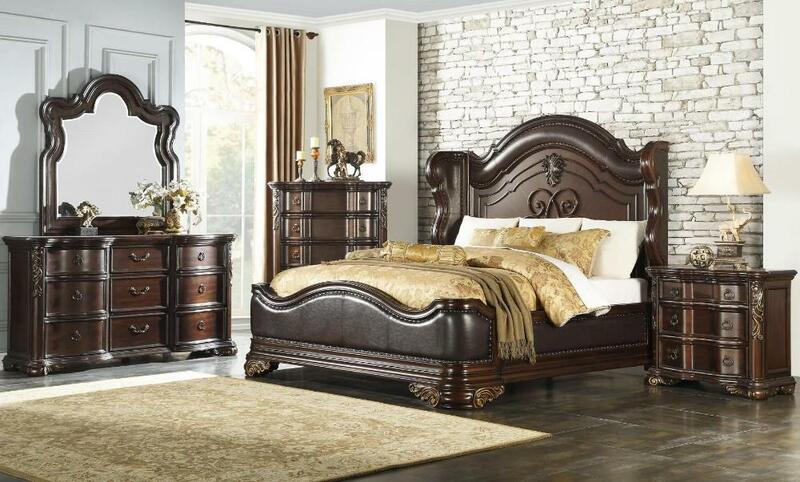 FEATURES: Rich Cherry Finish ~ Traditional Style ~ Brown Bi-Cast Vinyl Headboard & Footboard / Scrolling Adorns / Carved Scrolling Accents ~ Handle Metal Hardware ~ Dovetailed Drawers ~ Ball Bearing Side Glide.